Argh!! All these new Agents and Mars Mission sets and none in my area!! You shouldn't be mad with the massive amount of quality acquisitions you've gotten lately Fungal. You've actually made me jealous. Haha same place I picked up my new Agents set today. I looked at the Agents stuff at K-Mart on Saturday. It seems better value than the 'branded' stuff. Heh, I guess having sharks that can bite you in half isn't enough, they needed to put guns on them too. |      IMMA FIRIN MA LAZAR!!! Are the sharks bigger than the usual lego sharks? Im thinking of getting the agents sets as well. Fungal I told you which Kmart has it in my PM although itll be very far from you I suppose, just leave your car in nearest train stn from you and go by train, Kmart in that area is near train station. Kmart is at the back of Westpoint which is next to the train station itself. about 10-15 minutes walk thru Westpoint. But that's not really a hard thing to do now, is it? STL!! nice..you finally found that figure? It was either that or mutated, ill tempered sea bass. OMG! Thats the last of the Mars Mission set I need. I was in the city late and Myer was closed already. Darn it. Tomorrow it is. The sharks are brand new and BIG. You can actually fit a minifig inside it (with their arms raised up). The floating island and the speedboat are pretty good. The speedboat in particular is HUGE. A lot of these sets are bigger than what they look on the box. Set is $60. Here's a pic of the set. Note the size of the speedboat compared to the Agents Trailer. 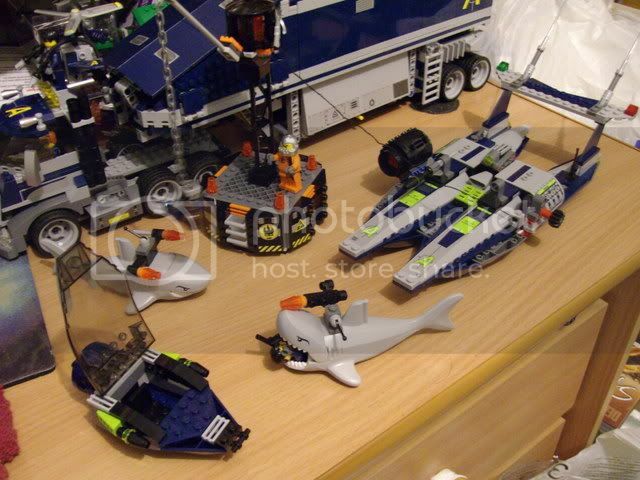 Also you can see Agent Chase being eaten by the shark up front. You can push a figure right in and shut the mouth. Also note the grappling hook attached to the light tower on the floating island with a zipline that you can put a figure on holding a little winch. Not pictured is the small jetboat hidden within the island which bursts thru the front wall of it by pushing a lever at the back. Last edited by Stompy; 4th September 2008 at 03:51 AM.